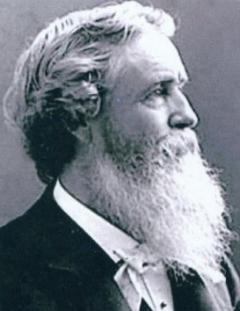 Hill was born in Birmingham, England, in 1829, and moved to the United States at the age of 15. During his early travels in his new home he became associated with the landscape painters of the Hudson River School. In 1861 he moved his family west to San Francisco where he opened his first studio. 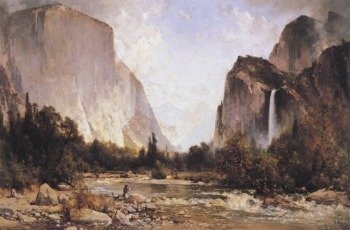 It is believed that his first trip to Yosemite was in 1865 with his friend and fellow painter Virgil Williams and photographer Carleton Watkins. After seeing Yosemite, he felt compelled to travel overseas to Europe where he spent time studying with several prominent landscape painters. He returned to the United States in 1867 where he spent the next five years in Boston painting and perfecting his technique. 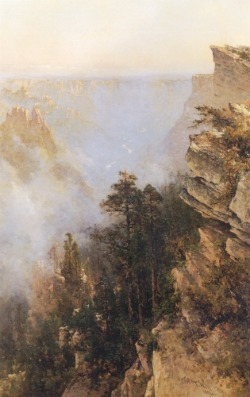 The family moved back to San Francisco in 1872 where Hill began to establish himself within the art community there with his sweeping landscapes of Yosemite. He built a studio in Wawona within a short traveling distance of the valley and concentrated his creative efforts there. 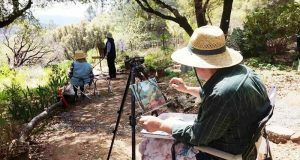 Before long he became known as Wawona’s artist in residence. 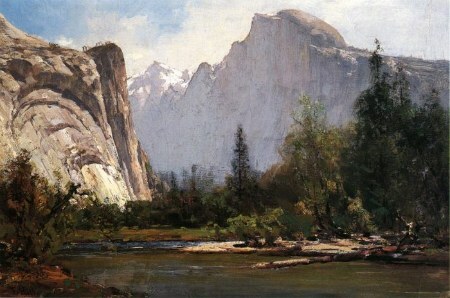 No other artist painted Yosemite as did Mr. Thomas Hill. His style was different from all others. Enthralled by its beauty, he put into his work a magic touch, a harmony and delicacy of coloring, which caught the marvelous atmospheric effect of the Yosemite Valley. In his pictures, this made for him great success, for he copied nature in all its beauty on his canvases in a simple, true style. Thomas Hill’s studio, which he built at Wawona, was a mecca for tourists from all parts of the world. The small cottage of three rooms had a porch across the front shaded by hop vines. Low wide steps led up to the porch and to the door opening into a large central room which was his picture gallery. The walls had, here and there, splendid deer antlers, a mountain lion pelt, a hornet’s nest, a rattlesnake skin. The floor was covered with magnificent huge grizzly bear and black bear skin rugs, all from the surrounding country. Half of the display gallery was strictly for his paintings. On the wall at far end of the studio, facing you as you entered the room and occupying the place of honor was a large painting of Yosemite, taken from Inspiration Point. It was a beautiful thing. The wall was covered with pictures of sublime scenes, done with the artist’s keen eye. Father never considered a painting finished ’till sold and sent on its way. His studio gallery most mornings found him looking at a newly painted picture, frequently stepping back to view it with a critical eye, then touching it up with his brush here and there. He was never satisfied. One morning on entering his display gallery he found a tourist on the floor, cutting the claws from his large California grizzly bear skin, a valuable, beautiful rug. Thomas Hill was a kindly and generous man. He did nothing to the man; he was glad he had been in time to stop the vandalism. My father loved trout fishing and early morning on some days found him up the river miles from Wawona, fishing and catching plenty, too. In later years he did not like to kill anything. He had a small fountain which he had built in front of his studio and he carefully took trout off the hook, put them in a container with water and carried them to this fountain, where he enjoyed feeding them with special food, morning and night, and watching them rise to bait, not for hooking and killing, but for their sustenance and a long happy life. He had a kind, gentle personality, very unassuming. Though he had reached success and fame, he took genuine pleasure in helping everyone, especially struggling young artists. He had no thought of effort required or time consumed, and did these friendly acts without thought of compensation. He was a poor manager of his business affairs…never held anyone to a contract or a promise. Asked no deposit on orders, or receipt for money loaned. He was much too trustful and some failed him. Mr. Hill was celebrated for his many large pictures, one of which, called “The Driving of the Last Spike” commemorates the completion of the first transcontinental railroad, where the Central Pacific jointed the Union Pacific Railroad at Promontory Point, Utah, May 10, 1869. The picture was painted on the order of Governor Leland Stanford of California, and now hangs in the State Capitol in Sacramento. Besides his talent in painting, he could do most anything well and loved to make things. He made a couple of fine row-boats for little Estella Lake, named for my sister, Estella Louise Hill, who married Mr. John Washburn. Over the shallow part, where willows grew, he extended a rustic walk with a bench or two that made a cozy spot for lovers. Tourists staying at Wawona Hotel enjoyed the walk to this restful place. In winter the lake supplied the hotel with its summer ice, which was cut and stored in an ice-house. During the last three years of his life he suffered from a weakness caused by his heart and it was necessary to occupy a comfortable little bungalow at Raymond, in the foothills, during winter months. 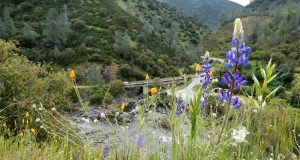 With the coming of spring, he returned to his beloved mountains and Wawona. 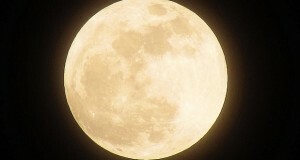 Though at this time nearing the end of his long, busy life, and a partial invalid, his work attracted him ’till the last. 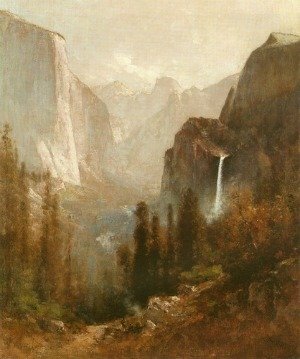 On September 11, 1908, in his seventy-ninth year, lacking ten weeks and few days of his birthday when he would have been eighty, death stilled forever his magic hand and prolific brush; still a kindly fate was given the famous interpreter of the Yosemite Valley, to depart from life, close to the land he loved. Dave Hubbard was born and raised in Yosemite National Park. For more fascinating stories about the history, wildlife and traditions of Yosemite, visit http://www.undiscovered-yosemite.com.